Scrap Copper outfought Boss Boss to break his maiden. Photo by Jim McCue, Maryland Jockey Club. Hamilton Smith-trained stablemates Partisan Divide and Scrap Copper, maiden winners over Laurel’s main track, will each look to conquer the turf in a competitive edition of the $100,000 Laurel Futurity. Jerry Romans Jr. and JoAnn Smith’s Partisan Divide and Kathleen Willier’s Scrap Copper will break from Post 2 and 3, respectively, in the Futurity, which attracted a field of 15 including three entered for main track only. The Futurity will be the third race for Partisan Divide, a son of Grade 1 turf winner Paddy O’Prado who was eighth in his July 13 unveiling at Laurel after being fractious in the gate, beaten less than five lengths. Stretched out from 5 ½ furlongs to a mile, he came with a five-wide run to win by 4 ½ lengths in an off-the-turf maiden special weight Aug. 2. Scrap Copper, a bay son of Great Notion, was a front-running half-length winner of his lone start, a July 22 maiden special weight at 5 ½ furlongs contested over a sloppy, sealed main track. 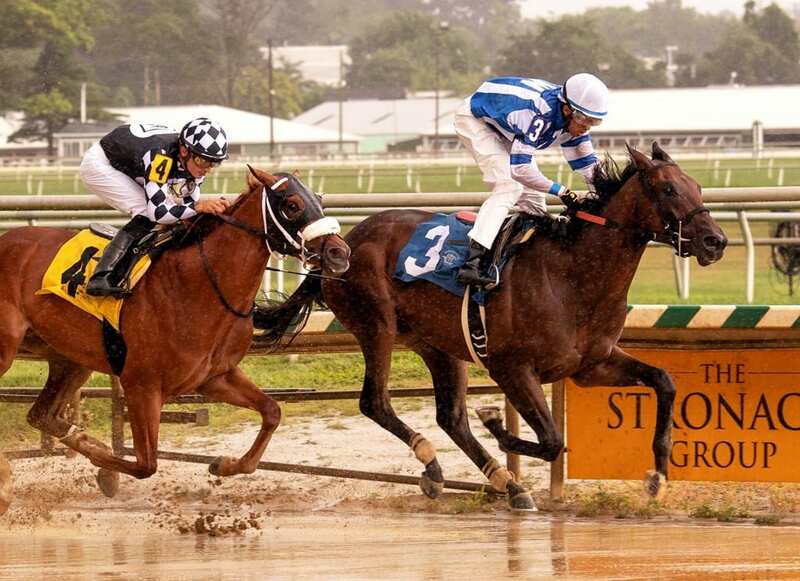 The runner-up, Boss Boss, came back to break his maiden by 2 ½ lengths Aug. 12. Isabelle Haskell de Tomaso’s homebred Regally Irish is out of the mare Irish Score, who is a half-sister to multiple graded-stakes winner Irish War Cry. Trained by Graham Motion, the Regal Ransom colt is the lone also-eligible in the field. Regally Irish has raced once, going all the way up front to win a 5 ½-furlong maiden special weight Aug. 26 over Monmouth’s main track. He has since breezed a bullet half-mile in 49 seconds over the dirt course at Fair Hill. Expected to vie for favoritism are New York maiden winners Market Bubble, the program choice at 7-2 coming off a half-length victory June 30 at Belmont Park, and Veterans Beach, who cruised by 1 ¾ at odds of 9-1 Aug. 10 at Saratoga and is listed at 9-2 on the morning line. Also entered are off-the-turf Tyro Stakes winner Mooji Moo Jr.; Yowza Yowza Yowza, Crypto Currency, Stole E, Alwaysmining, Absolved and Order and Law. Thatwouldbegrand, Lippi Lorenzo and Mount Travers can run if the race is moved to the main track. Previously run on dirt and contested as a Grade 1 (1973-88), Grade 2 (1989) and Grade 3 (1994-2004) event, the Laurel Futurity was hosted by Pimlico from its debut in 1921 until moving primarily to Laurel in 1966. Among its storied winners are Triple Crown champions Count Fleet, Citation, Secretariat and Affirmed, Spectacular Bid, Tapit and Barbaro.